look at this!. . Wallpaper and background images in the Gravity Falls club tagged: gravity falls gravity falls mabel clue. What episode is this? D; MUST WATCH IT! Hint hint. I think we should start watching the show more closely. Omg I'm so creeped out that explains why I felt like I was being watched!! 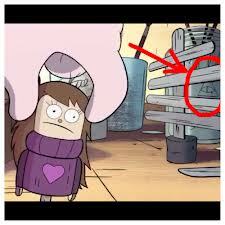 Why would they hide an illuminati in gravity falls?